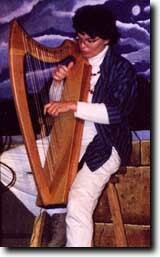 For over fifteen years, Carolyn has been playing her portable harp in homes, hospitals, hospices and long-term care centers for those who are dying and for their families. The sound of harp music helps soothe people who are suffering by altering their mood, relieving pain, lessening isolation, and allowing some control of their environment. It provides spiritual support and can elicit memories of life stories to share and enjoy together with family. Carolyn carefully chooses music to give solace during a time of transition and often uncertainty, always with the intent of reaching the heart and soul of each person. She helps families and their loved ones deal with this time of loss in varying ways: through music as a distraction or music for comfort, beauty and joy. Because music can connect so directly with the listener on a non-verbal level, Carolyn often improvises music especially aligned with the loved one's aura, aiding their journey from this life. She will also honor requests for special songs or musical styles by the family. The quiet allure of the harp can sound like breath itself at the bedside of a dying person, its vibrating tones giving asense of flow and ease. It is a wonder to behold: this harp, this music, and this sacred time of life for this special person. Music can bring family members and their loved one together in a way that is lasting even beyond death. After death Carolyn has played for a day-long vigil, for a religious ritual of transition, during a ceremony where ashes were dispersed in a river, at a morgue during a visitation, and at funeral services. She has even played at gravesites in memory of family members. She also offers meditative music especially for family members to aid in their healing after the loss of a loved one. Carolyn supervises students interested in playing for hospice and memorial services, directing their attention to the quality and mood of music chosen. For some details about Carolyn's playing for the end of life, please read the article about her featured in the Boulder Daily Camera on 12/6/2015, entitled, "Bedside musicians aim to soothe those who are suffering, dying".